Posted on October 4, 2013 by Susan H.
Did you know…Anaphylaxis Canada and Loblaw Pharmacies have formed a partnership to create a new Food Allergy Management Assessment Program? Click here for a link. Registered Dietitian, Lisa Ireland at the Loblaw Pickering location…was recently featured in our local paper promoting healthy food choices for the family with a series titled “Your Life: Healthy alternatives for the whole family to enjoy.” Click here for the article. I was pleased to note the series included, “Your Life Nutrition: Managing food allergies at school.” Click here for the link. I love the combination of Anaphylaxis Canada, a dietitian and grocery store. Any questions you may have concerning food allergens, nutritional requirements and food products can be answered by the local Loblaw dietitian or pharmacist. Fabulous! 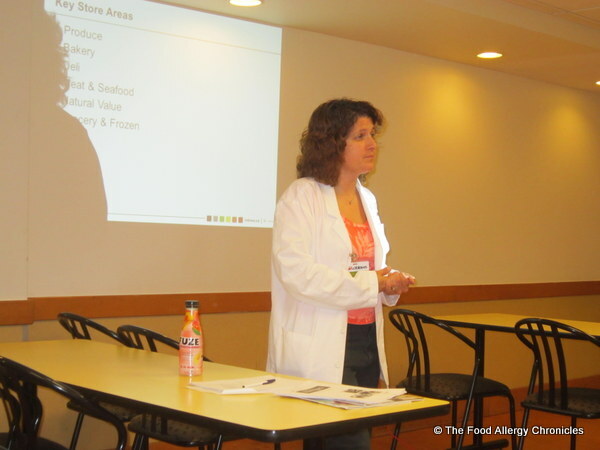 I recently attended one of the educational classes, titled Allergy Class, at the Pickering Loblaw location. The pharmacist covered the basics of Anaphylaxis that was developed by Anaphylaxis Canada followed by Registered Dietitian Lisa Ireland’s overview of meeting one’s nutritional needs with food allergies, reading labels carefully for potential food allergens and answering many personal questions. The Allergy Class provided hand-outs including pamphlets from Anaphylaxis Canada, EpiPen, Allerject, Government of Canada, and a fantasic booklet from Anaphylaxis Canada titled, “Living Confidently With Food Allergy: A guide for parents and families. I think the partnership of Anaphylaxis Canada and Loblaw Pharmacies with the concept of educating about food allergies ‘in-store’ is genius. Such a shame that offering a Food Allergy Cooking Class is not possible due to…cross-contamination issues. Besides living in a bubble…cross-contamination issues in kitchens will always be ‘on the table’. Learning how to avoid and minimize cross-contamination in the kitchen…now that is a lesson worth giving. Has anyone participated in the Anaphylaxis Canada and Loblaw Pharmacies Food Allergy Management Assessment Program? This entry was posted in allergies, Allerject, EpiPen, multiple food allergies, Tips For Parents With Children With Food Allergies In The School System and tagged Anaphylaxis Canada and Loblaw Pharmacies unite, Loblaw's Allergy Class, Registered Dietitian Lisa Ireland and Loblaw Pharmacy Allergy Class, Registered Dietitian Lisa Ireland's tips for managing food allergies at school by Susan H.. Bookmark the permalink.